Supports positive mood, and radiant skin and hair. Created specifically to address the unique needs of women. 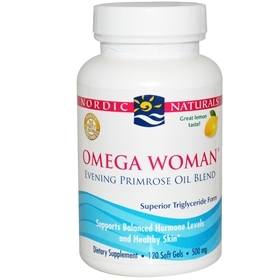 Omega Woman blends the high-potency omega-6 (GLA) from evening primrose oil with a touch of EPA and DHA for balance. Recent research has shown that GLA promotes the production of beneficial prostaglandins, which naturally balance a woman’s hormones. GLA also supports a clear, healthy complexion.